Running addicts and Dad’s Army – have you met the Catch Up® office team? 10th February 2017 - Running addicts and Dad’s Army – have you met the Catch Up® office team? 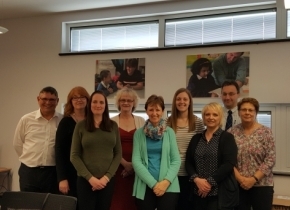 The Catch Up® team is made up of office staff, trainers, directors, and trustees, all of whom are dedicated to helping as many struggling learners as possible by supporting teachers and teaching assistants to use our interventions. We recently welcomed new Catch Up® team member, Caroline Sulman, who has been supporting finance and office administration since she joined us last year. Read all about Caroline and the rest of the office staff….and find out who are the netball players and bungee jumpers amongst them!